"Ko au te awa. Ko te awa ko au" (I am the river. The river is me). For Maori, the Whanganui River has always been of great spiritual significance. In March 2017, the Whanganui River made international headlines when the river was granted the same legal status as a person. After 140 years of fighting legal battles, the local Maori finally succeeded in gaining protection for the Whanganui, which the tribes consider one of their ancestors. The region's history has also been a bloody one, from intertribal wars to the battles between Maori and the British colonialists in the middle of the 19th century. Vincent Ward: "The Whanganui River iwi were the heart of the film for us. They were welcoming and our guides (kai te ake - guardians of the river), and they became part of the crew and cast, peopling the movie, giving it authenticity and distinctiveness. Along with the actors and iwi, the River itself became a fundamental star of our film." The film itself tells an intimate story set during the 1860s in which a young Irish woman Sarah and her son find themselves on opposite sides of the turbulent wars between the British and Maori. Sarah (Samantha Morton) and the Maori warrior Wiremu (Kiwi actor Cliff Curtis) travelling up the Whanganui. After watching the film, I decided to travel to the Whanganui region in order to undertake my very own river journey and explore an area that is still mostly covered in dense native bush. The city of Whanganui, a lively hub near the mouth of the river, seemed a logical starting point for my trip. The view from Durie Hill towards the city of Whanganui and the Whanganui River. The region's capital has just over 40,000 inhabitants (which for New Zealand is actually quite large). As the city lies off the main tourist routes, it still has a very authentic and real feel to it. I wanted to know more about the role of the river, both in the movie as well as for Maori, so I caught up with two people who know and love the region. 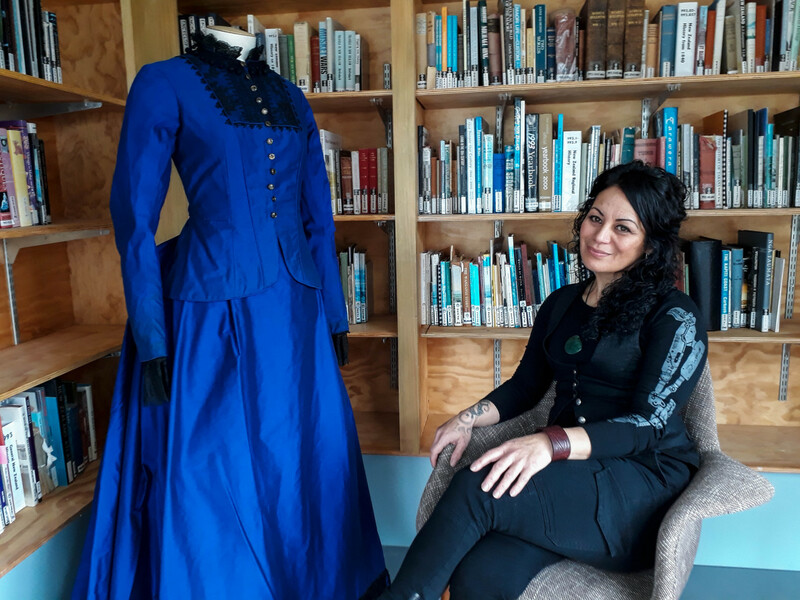 Lee Williams is a Whanganui-based costume technician. River Queen was her first film project and was responsible for catapulting her career. Since then she has worked on more than 30 productions. 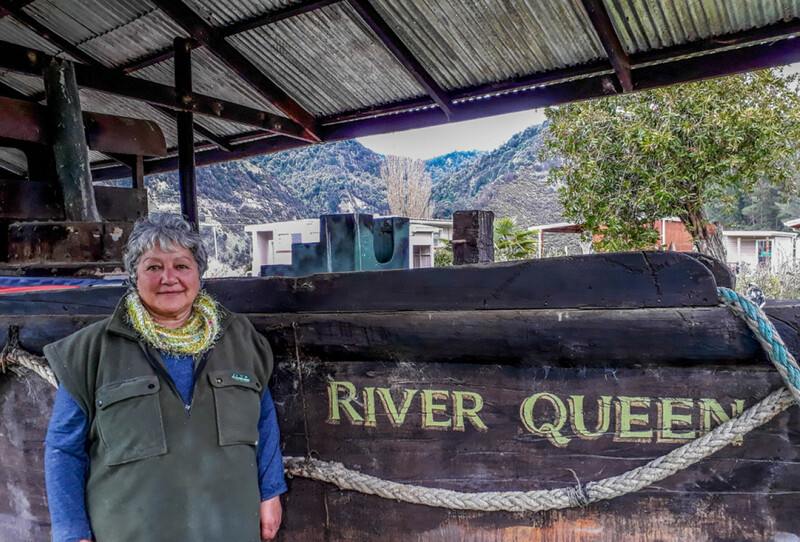 Despite this, River Queen remains her favourite project because for her "it's a home story". What makes the story even more powerful for Lee is the fact that it features "a Scottish woman and a Maori man - which is my mother's parents' story." I interviewed Lee Williams in the research library of the Whanganui Regional Museum. The museum's curator, Trish Nugent-Lyne, was kind enough to set up one of the original dresses that Samantha Morton wore in River Queen. Geoffrey Hipango is born and bred in Whanganui and his tribal links to the river go back generations. "The connection of being raised on the river has been very strong for me, from the time I was born." His nephew Ash Patea operates the tourism business Whanganui River Tours that offers multi-day kayak tours in combination with Marae stays (a Marae is a Maori communal meeting house). 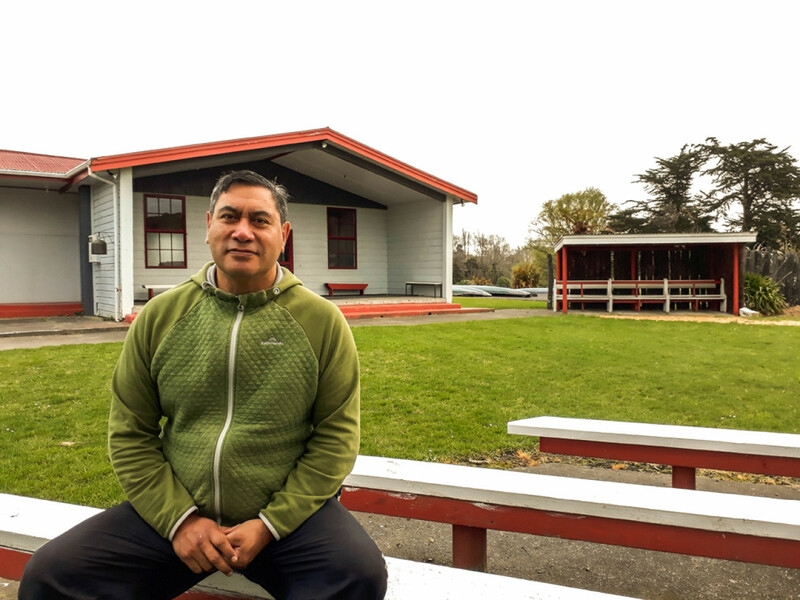 Geoffrey Hipango at Te Ao Hou Marae in Whanganui. If you book a guided kayak tour with his nephew Ash, you will be treated to an overnight stay in the Marae which is a very unique experience and only possible by special invitation from a member of the resident iwi (tribe). With Lee and Geoffrey's stories in mind, I set off for my first encounter with the river. I parked at Taupo Quay, which is part of the city's river promenade and next to the River Traders Market (held every Saturday morning), and caught up with Ann Petherick. Ann is the Chair of the Waimarie Operating Trust that runs river tours onboard the historic paddle steamer "Waimarie". The Waimarie during its heyday. Not much has changed onboard since then (apart from the odd health & safety addition). The trust also runs the excellent Waimarie Museum, housed in a wonderful historic building next to the steamer wharf. The museum tells the fascinating story of the region's riverboat era dating back to the first half of the 20th century. Once you've had your dose of history, head outside and experience the real thing: A cruise up the river with the only river steamboat left in the country. You can even have a chat with engineer John and in the steam engine room and try your hands at shovelling coal. These days, upriver travel is much faster than back in the paddle steamer days. Opened in 1934, the windy Whanganui River Road takes you straight into the heart of the riverlands. From Whanganui, head out of town on Highway 4 for 14 kilometres before taking the river road on your left. The turn-off is clearly signposted. Within the first three kilometres, the road climbs up the steep side of the river valley before it dips down to the river on the other side. Pull over at the highest point and take in the remote atmosphere of the landscape stretching out below. Geoffrey Hipango: "We acknowledge the river as Tuākana, as an elder, as a living entity. Also spiritually: We would go to the river and pray. I’ve also found that it’s a fantastic way for people to come together who are looking for healing. The shared beauty of the river allows the mind and the spirit to settle." In the movie River Queen, the river is seldomly seen in a wide shot. But for the establisher, the filmmakers contracted LA-based design company HatchFX to create a number of matte paintings. This is how the river valley might have looked in the 1860s - the period in which River Queen takes place. Lee Williams: "River Queen was our story. It was a Whanganui story. Every face I knew. I grew up with them. The only faces I didn’t know were from the people they brought in from overseas." 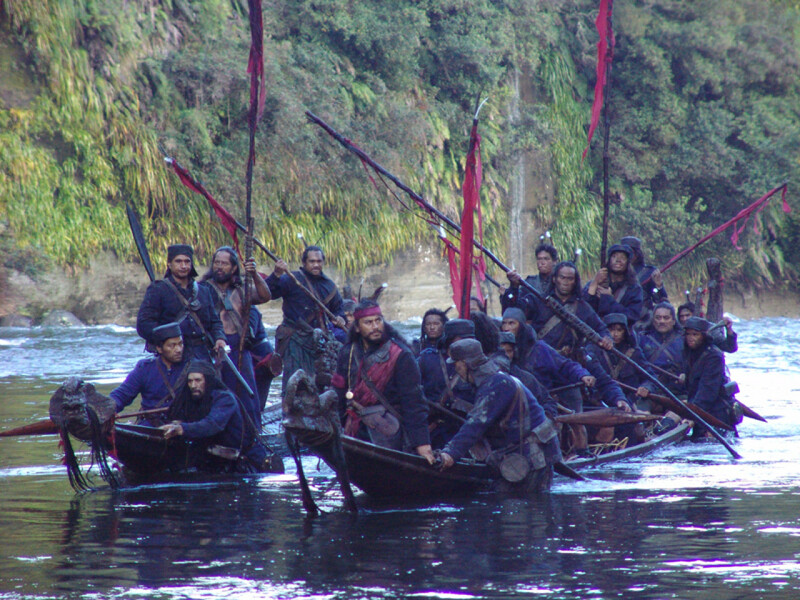 A scene from River Queen: Kupapa Warriors (colonial Maori forces) travelling downriver in their wakas (canoe). I continued downhill on the River Road and after 30 minutes, I reached my destination for the day: The Flying Fox Lodge. As the name suggests, guests are treated to a unique experience - the only means of reaching the lodge from the road is to use their flying fox which transports visitors and their luggage across the river. The funniest bit? Before you get into the flying fox you have to ring a big gong to let the owners on the other side of the river know you've arrived (there's no mobile phone coverage this deep into the bush). Once they know you're there, you can jump into the cabin and they will communicate with you by walkie talkie. Then all you need to do is hold on and enjoy the ride! This is me arriving in style at the Flying Fox Lodge. I was welcomed by hosts Jane and Kelly who bought the lodge in early 2016. You can tell that they love what they do and that they are totally dedicated to their business. Luckily, because it was off-season, I was the only guest for the night. Jane and Kelly invited me to join them over dinner (venison pie with roasted veggies, followed by a Kiwi dessert called Ambrosia). It was such a lovely evening. Thank you, guys! My cabin just after dawn. The kitchen and lounge are downstairs, the bedroom is upstairs. This is about as close to nature as it gets, including wild deer grazing outside your window early in the morning. 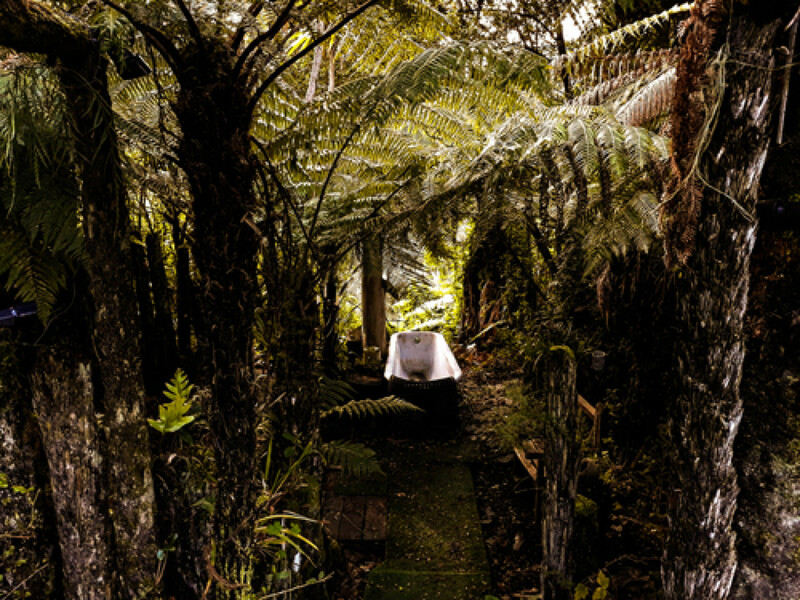 The Flying Fox Lodge might not offer five-star luxury accommodation, but where else can you have a bath amongst the tree ferns? The next morning, I was picked up by jetboat pilot Mark Wickham who owns and operates the Whanganui Scenic Experience Jet. The special feature of these boats is their engine design which allows them to navigate even the shallowest rivers. Water is sucked through an intake into a pump-jet inside the boat and then expelled through a nozzle, therefore replacing an externally propelled engine. The invention goes back to New Zealander Sir William Hamilton who developed the first jetboat in 1954. Mark has been a jetboat driver on the river for many years and knows every rapid like the back of his hand. Mark had planned stops at two film-specific places for me to have a look at. We'd been zipping up the river for about 30 minutes when finally the tower of a wooden church came into view. The church forms the centre of a tiny village by the name of Jerusalem (in Māori, Hiruhārama) and is the house of worship for the "Sisters of Compassion", an order of nuns that was founded here in 1892. From 2010 to 2011, New Zealand filmmakers Miriam Smith and Christopher Pryor lived and filmed in Jerusalem for a year. Their documentary How Far is Heaven is focused on the youngest Sister and newest arrival - Margaret Mary. The story follows her daily life between the convent and her role as a voluntary teacher at the local school - a world of opposing forces between Maoridom and Christian spirituality. The old convent offers accommodation for groups and retreats. Lee Williams loves the atmosphere in and around Hiruhārama "because it's healing". After enjoying a cup of tea in this serene place, we hopped back in the jetboat and returned downriver to the Matahiwi Café. The café/gallery is run by Marlene Ranginui who serves tea, cakes, slices, scones and gluten-free muffins. My main point of interest was outside in front of the building: the original wooden steamboat that carries Sarah (Samantha Morton) to safety in River Queen. Marlene and the River Queen. Mark, Marlene and I shared some lunch before it was time to hit the river again. Mark dropped me back at the Flying Fox Lodge where I said goodbye to Jane and Kelly. The road from here continues for another 40 kilometres north to Pipiriki. If you are keen to explore the area where most of River Queen was filmed, including the location of the purpose-built garrison, you have to travel north from Pipiriki - which is only accessible by jetboat. Mark is happy to take you all the way, or else there are a couple of other operators serving the area. The location of the British frontier garrison. It was a massive undertaking to film in this remote spot, as everything and everyone had to be brought in by jetboat. The main reason that most tourists come this far up river is to visit the Bridge to Nowhere - a concrete bridge that was built in 1936 but never connected to any roads. The idea was to provide access to this remote part of the country, yet the area proved too difficult and too remote to be farmed. 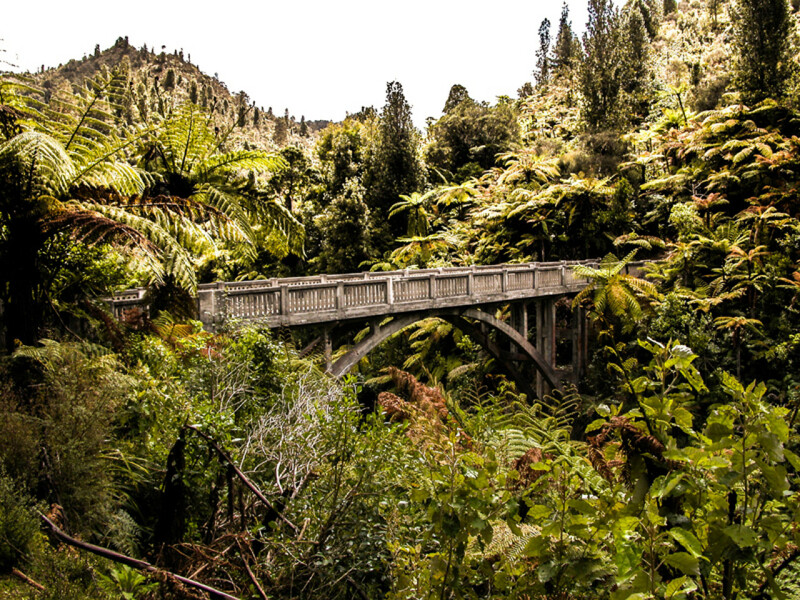 The Bridge to Nowhere spans the Mangapurua Gorge and can be reached on foot or by mountain bike. For the return trip back to civilisation, many travellers opt to paddle back down river. If you let your jetboat operator know in advance, they will organise canoes for you. During both of my visits to the Whanganui, I was very restricted with my time which is something I deeply regret. I would love to go on a longer location and paddle the course of the river from Taumarunui all the way to Whanganui township, a route that is also considered one of New Zealand's nine Great Walks (despite the fact that you tackle it in a canoe and not with your own two feet). Finally, I asked Lee Williams if there was any lasting impact from the filming of River Queen on the Whanganui region. Her response: "The movie gave us positivity. A sense of ownership. It helped to put us on the map in a really good way because Whanganui seems to get a bit of a bad reputation in the media that it doesn’t deserve. The appreciation of how beautiful our town is. How beautiful our Awa is. How beautiful our Ngahere, our forest is. So I think it gave a lot of people here some incredible pride about their town." The map below shows the route I took during my visit. The Whanganui Regional Museum captures the cultural and historical essence of the people of Whanganui. If you're a passionate car lover, why not pay a visit to Ed Boyd's Autobarn and his collection of vintage cars. Ed Boyd's private collection showcases over thirty classic cars from mainland Europe and the UK. Two props from River Queen are on display, too - a cannon and a tatooist's horse cart. Durie Hill gives you an awesome view over the city of Whanganui. Take the underground elevator for a fun ride. The River Traders Market is held every Saturday morning. Stalls are set up along the river bank and the produce is mainly regional. Book a cruise aboard the paddle steamer Waimarie. Before you take off, use the opportunity to visit the adjacent Waimarie Museum. Whanganui River Tours offer canoe trips on the river with a focus on storytelling and Maori culture. Battle your inner vertigo and take the flying fox across the river to the The Flying Fox Lodge. Hit the rapids with Mark and his jetboat - Whanganui Scenic Experience Jet. Visit the Sisters of Compassion in Jerusalem and stay at the old convent. Don't forget to stop at the Matahiwi Café and try one of Marlene's scones. The original River Queen boat is there, too.